Dates refer to recording, not composition. Someone the other day was saying to me that ‘light music’ is not challenging or demanding. It can be listened to with only ‘half an ear’. No doubt they would have gone on to suggest that it is ‘lacking’ because it does not need analysis and commentary. Few books will be written that profile the genesis, structure and reception of Cyril Watters’ ‘On a Cheerful Note.’ My answer is that pieces such as those showcased on this CD are not meant to move the Western ‘classical’ music project forward. They are not designed to change the way we think about music. This is not Mahler, Wagner, or Messiaen creating a new musical cosmos. Light music is simply music that sounds good and is invariably well written. The emotional impact is more akin to a postcard from the seaside rather than War and Peace. It often acts as a mental stimulus to a long-forgotten event or mood. Light music is to be enjoyed, even if the mood is occasionally wistful or nostalgic. It is not to be intellectualised. My friend probably lost me at this point. 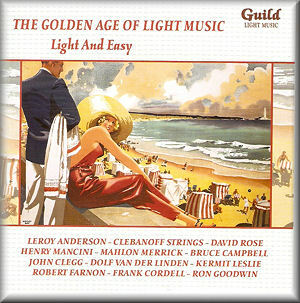 The title of this new CD in the epic series The Golden Age of Light Music sums up the mood well. There is little here that will challenge the listener beyond the pleasure of sheer enjoyment, if not indulgence. Like many collections of light music, there are two types of piece. One is the arrangement of a ‘standard’ tune – often from a musical or a film. The other classification is the mood-picture describing a scene, an event or a state of mind. Both genres are well represented here. I must state a preference, however, for the latter. These were often pieces that ended up in music libraries and were subsequently used in newsreels or documentaries. However, as discrete ‘works of art’ they charm and delight. The title track, Light and Easy, by Harry Rabinowitz is a great example of a completely laid-back little tune, that evokes hot summer days in the country or at the seaside. The following ‘original’ number by Cyril Watters, On a Cheerful Note, largely continues this mood of well-being. I had not come across Mahlon Merrick before: he writes a charming tune, which makes use of Wind bells at the beginning and the end. The evocation of a train trip by Bruce Campbell adds to the store of ‘railway’ themed pieces that include Coronation Scot by Vivian Ellis and Puffin’ Billy by Edward White. However, I guess from the tempo that this particular train is not going fast: it is more like Edward Thomas’ Adlestrop than Waterloo. Angela Morley’s Fashion Show is a deliciously romantic number that creates images of wide skirts, fitted pullovers and evening gowns by Dior. A flight to the United States with Pan Am is depicted by Philip Green – most probably to the TWA terminal at Idlewild! Clive Richardson can always be relied on to paint a fine picture. This time it is of a Las Vegas Lady. Full of vigour, she is not the sort of person I would like to argue with over the roulette table. A touch of the Wild West there. Moreover, Las Vegas is the subject of Laurie Johnson’s contribution too. Although, here it is the glamour and pizzazz that he depicts. It is one of those tunes that everyone probably knows, but cannot quite place. It was used for Johnny Morris’s Animal Magic Show after 1962. Kermit Leslie probably got his name before the advent of the Muppets; however, he and his more conventionally named brother Walter were inspired to depict a Bermuda Holiday. I wonder if they ever went there? Anthony Mayer’s Hilltop Holiday is a catchy little piece that employs good brass writing and sweeping strings. It is not possible to identify the location; however, I guess that it is probably Tuscany rather than Lancashire. Alan Perry, or to give him his real name, Ernest Tomlinson writes a rip-roaring tune called Gay Time – long before the word took on any other meaning. The scene is really Blackpool Pleasure Beach and the Big Dipper. Bernie Wayne contributes a concerto, at least of the Warsaw variety. This ‘long for light music’ work lasts for nearly seven minutes. Blues on the Rocks is a sophisticated number that explores soft jazz and blues musical devices. Yawn! Too early! David Rose’s 4:20 AM is a smoochy, smoky little piece that evokes a late night/early morning club. A good piece from the man who gave the world ‘The Stripper’. In fact, there are hints of that particular masterpiece in this tune. After a night on the tiles what could be better than Robert Farnon’s Lazy Day. We all love them, especially in the garden or on the beach at Morecambe on a sultry summer’s day. Waitin’ for the Dawn by Ron Goodwin is a steamy little piece. Good use is made of the saxophone and the wire brushes on the drums. A romantic tune reminds the listener of the lady he danced with but has now gone. Mute brass adds to the introverted feel of this piece. One of the best on the CD. Finally, Bob Haymes closes the proceedings with the moody That’s All. This is played by Henry Mancini and his orchestra. In fact, this number used to be the ‘sign off’ tune for Alan Dell’s radio show ‘Sounds Easy’. The ‘arrangements’ section of this CD gets of to a flying start with Leroy Anderson’s exuberant ‘Pyramid Dance’ from the musical Goldilocks. This is full of Eastern delights with just a touch of Hollywood thrown in for good measure. Kurt Weill is represented by his ubiquitous ‘Mack the Knife’, oozing life on the sidewalk. However, this is a cool, rather than sinister arrangement. The musical Can-Can is as French as it gets and ‘I Love Paris’ is evocative of many happy days sat in a street café watching the world go by. The music is by Cole Porter and is played appropriately enough by the Paris Theatre Orchestra. The song 'A Cup of Coffee, A Sandwich and You' is from Jack Buchanan’s Charlot Review from 1925. The lyrics nod to Edward Fitzgerald’s Rubaiyat of Omar Khayyam. A good balance here between lively and wistful. I loved the old standard ‘I’ll be seeing you’ even if it did take three composers and arrangers to dish it up in the form presented here. Harold Arlen’s highly romantic ‘Now I Know’ from the film Up in Arms is another little masterpiece. All the big romantic tunes are packed together in these tracks: Jerry Bock’s 'This Might be Love' is like the grass after rain, lush. It gives one the goose bumps. The old classic ‘Stella by Starlight’ is given the shimmering strings treatments. Two more arrangements follow – one, more than you know’ from the musical Great Day by Vincent Youmans and the other ‘There’s a lull in my life’ from the film Wake up and Live. The first is a touch wistful, the second a little bit more upbeat, but still reflective. As always, the performances of these pieces are outstanding. All the artists were well known in their day, even if some are largely forgotten in 2012. David Adès has done a wonderful job restoring this music and writing the liner-notes. I have said this before, but there does seem to be an endless store of this sort of music. As Guild rapidly head towards the ninetieth album in this series, it is a project that has been extremely worthwhile and has added a vast amount of good light music to the catalogues. The present CD, Light and Easy is an excellent example of what makes this series so impressive. An excellent example of what makes this series so impressive.